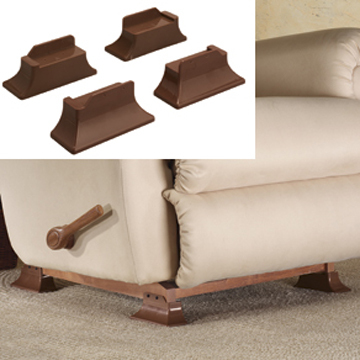 The Recliner Risers make it easy to stand out of your recliner. These base lifts raise your recliner 3-4 inches to give you more leverage while standing. Raises Recliner Height - Makes standing or sitting easy. Adaptable - Fits rocking and reclining chairs. Padded Base - Base pads protect floor from damage or marks. Easy Assembly - Installs quickly with included wood screws. Rocker Limiter - Limits forward tilt to make standing safe and easy. Low Profile -Matches look and feel of furniture.